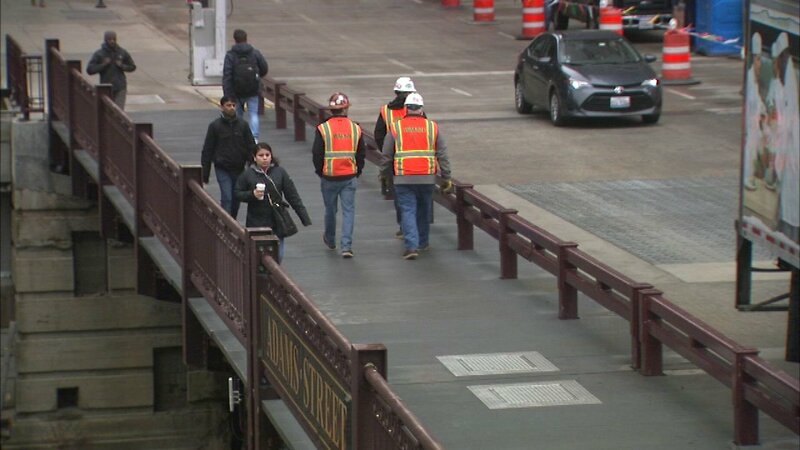 CHICAGO (WLS) -- The Adams Street Bridge reopened Friday morning after a 13 month long rehab project. The bridge has been around since 1927 and is one of 37 across the city that can be raised to allow boats to pass through on the Chicago River. Starting Monday those bridges will be raised and lowered to make sure they are in good working order ahead of the summer boating season. The Chicago Department of Transportation said drivers should avoid the closures and use different routes. S. Ashland Ave. Bridge - Monday February 27, 9:30 a.m.-2:30 p.m.
Loomis St. Bridge - Tuesday February 28, 9:30 a.m.-2:30 p.m.
S. Halsted St. Bridge - Wednesday March 1, 9:30am-2:30 p.m.
Cermak Road Bridge - Thursday March 2, 9:30 a.m.-2:30 p.m.
S. Canal St. Bridge - Friday March 3, 9:30 a.m.-2:30 p.m.
18th St. Bridge - Tuesday March 7, 9:30 a.m.-2:30 p.m.
Wabash Ave. Bridge - Wednesday March 8, 9:30 a.m.-2:30 p.m.
Dearborn St. Bridge - Friday March 10, 9:30 a.m.-2:30 p.m.
Clark St. Bridge - Monday, March 13, 9:30 a.m.-2:30 p.m.
Franklin St. Bridge - Tuesday March 14, 9:30 a.m.-2:30 p.m.
Harrison St. Bridge - Wednesday, March 15, 9:30 a.m.-2:30 p.m.
Van Buren St. Bridge - Thursday, March 16, 9:30 a.m.-2:30 p.m.
Jackson St. Bridge - Monday March 20, 9:30 a.m.-2:30 p.m.
Monroe St. Bridge - Tuesday, March 21, 9:30 a.m.-2:30 p.m.
Madison St. Bridge - Wednesday March 22, 9:30 a.m.-2:30 p.m.
Washington St. Bridge - Thursday March 23, 9:30 a.m.-2:30 p.m.
Randolph Street Bridge - Friday, March 24 from 9:30 a.m. 2:30 p.m.
Roosevelt Rd. Bridge - Thursday, March 9 to Friday March 10, 10 p.m.-2 a.m.
Michigan Avenue Bridge - Thursday, March 16 to Friday, March 17 from10 p.m.5 a.m.
Lake Shore Dr. Bridge - Saturday, March 18 to Sunday March 19, 10 p.m.-5 a.m.
Lake St. Bridge - Sunday, March 26, 12 a.m.-5 a.m.
Wells St. Bridge - Sunday April 4, 12 a.m.-5 a.m.